Everledger founder and CEO Leanne Kemp at IBM's Edge 2016 conference. For an event that was organized by IBM, one of the largest (and oldest) technology companies in the world, it was no surprise to hear “innovation” being the center point of this year’s edition of the Edge conference. Staged in the United States in September at the MGM Grand in Las Vegas, Edge 2016 aimed to inspire its attendees to “outthink the status quo,” with IBM using the event to showcase how it was enabling great strides and delivering value in fields as varied as cognitive business, cloud technology and collaborative innovation. High-ranking IBM executives like IBM Systems Senior Vice President Tom Rosamilia took to the Edge 2016 stage to deliver this message, which was further bolstered by its partners in these endeavors, which included bigwigs like Red Bull Racing, Welch’s, and Hortonworks. But while all of these prolific industry names gave presentations that were impressive in their own right, I must admit here that, from a personal standpoint, the Edge 2016 speaker that particularly stood out to me –entrepreneur Leanne Kemp- didn’t belong to a “big” company per se: Kemp is the founder and CEO of an 18-month-old startup called Everledger, that currently employs a team of 20 people. But as Kemp outlined the work that her enterprise was doing, the technology it was using to do this, and the scope of its applications, it was easy to see why the London-headquartered Everledger (with offices in Australia and New York) warranted a presence on the Edge 2016 stage, despite the company’s relatively young age and small size- this startup definitely seems to be on to something with its offering, and Kemp’s passion and drive for her company was, quite simply, grand and infectious. Everledger describes itself as “a permanent, digital, global ledger that tracks and protects diamonds and other valuable goods on their lifetime journey.” With the use of technology like blockchain, smart contracts, machine vision and AI, this startup essentially creates an immutable digital footprint for a diamond, thereby providing a secure, transparent record which stakeholders throughout the supply chain can use to track and protect their assets. Given its current focus on the diamond industry, Kemp explains that Everledger’s clients include banks, insurance companies and certification houses, and its technology has, so far, been used to certify over a million diamonds. That’s no small feat for a company that was founded only in April 2015, which also boasts of having won a number of industry awards, like the 2015 BBVA Europe Open Talent Competition, the 2015 Meffy Awards, and the 2016 Fintech Finals, to name a few. IBM Systems Senior Vice President Tom Rosamilia at IBM's Edge 2016 conference. Image credit: IBM. 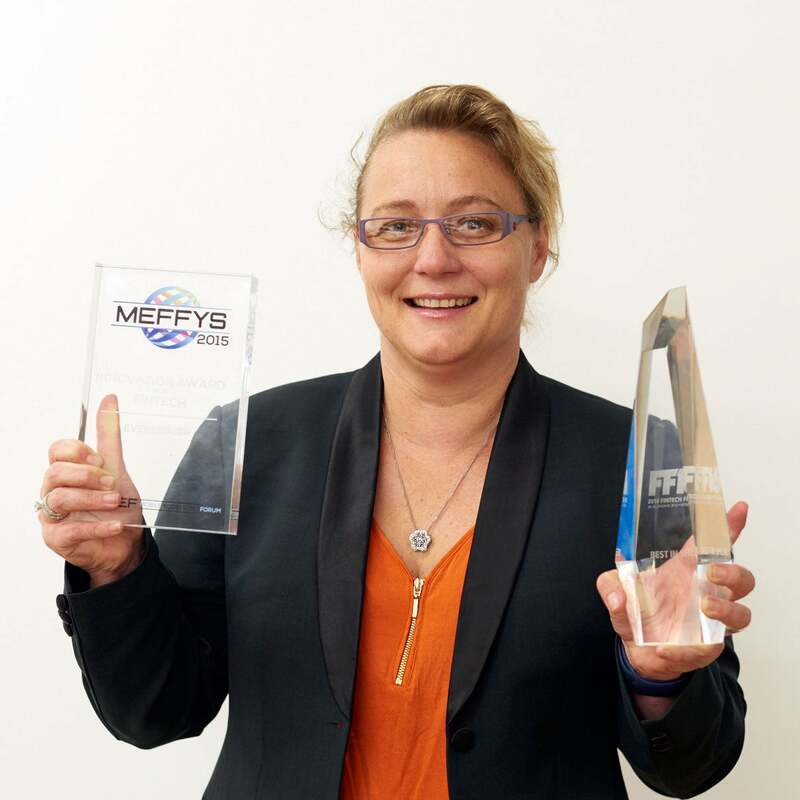 Everledger founder and CEO Leanne Kemp with a few of the awards her startup has won in the past. Image credit: Everledger.